I will put an advanced warning here that I will be talking a little bit about photography and the lunar eclipse that occurred late Monday Night/Early Tuesday Morning of last week. If you have no interested in reading anything like this then do not read the last bit of this entry, but if it does interest you then you should read the last bit of this entry. Lets start with knitting first. I have finally started the first sock out of Knit Sock Love, finally. These are socks for a fellow knitting, because she likes the socks that I make, and she has worn out one of the pairs I have made her. Well they are extremely faded and will need replacing very soon. I was given yarn from her stash, some Canon Hand Dyes in Cheshire Cat. The pattern is Wedge, I am finding it quite interesting. Thankfully she has smaller feet then I do and so the little bit of cuff and leg that I have done has gone quite fast. 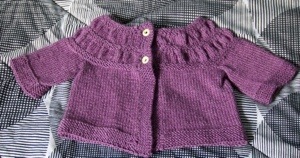 I did finish the Baby Tea Leaves, buttons sewed in, blocked and all. I was kind of surprised that it took longer to make the actual garment then I anticipated. I think it was because of the ruffling in the beginning yoke of the sweater. None the less I am very happy with it and I hope that the recipient is happy with it as well. It was knit out of Frog Tree Pediboo. But what about the social pressure experiment implications? I have been thinking about this, since I am knitting something from stash (not my own however) and I’m not buying anything new. So what would be fair for me and the experiment? I think that once I complete the project and give the scrap yarn and the socks back to the owner I will put a skein of equal yardage into a “emergency fund.” What I mean by that is if I break down sometime and buy yarn when I haven’t earned it I can go ahead and pull from the emergency fund and use that yardage towards that purchase. If there is yardage left that wasn’t covered then the normal rules would apply. I think that this is a fair rule, do you agree? Honestly I have not had a lot of time to do a lot of knitting, with finals coming up and still working my time to myself, to do anything fun, is very small. Thats one reason these blog entries are late and not as frequent as they should/used to be. I am working on fixing that, so in the event of crazy life events, I will have entries going up still. Finals are coming up, so that shall be interesting. Finally lets discuss the lunar eclipse. I will say I was kind of disappointed with the eclipse in general. Not that the eclipse was not fun to watch, but there was a problem with the conditions that night. The sky was not the clearest, it had this kind of milky haze on it. That made it difficult to get some clear shots of the moon as it was entering the first shadow. Which the night before I took pictures outside to make sure I was able to get some shots of the moon, which I was because the sky conditions were very good. Because of that the photos aren’t as clear as the night prior. Not only that the moon was darker then anticipated. The combination of this and the milky sky, at least for me, did not equate to good pictures, or pictures at all. However the night prior I think I got some good pictures of the full moon, which I quite enjoy looking at. If there is enough interest in seeing some of my non-knitting related photography I can post some up here and there. Let me know about that. There are a lot of things that I really enjoy knitting on, specific kinds of patterns, textures, colors, etc. 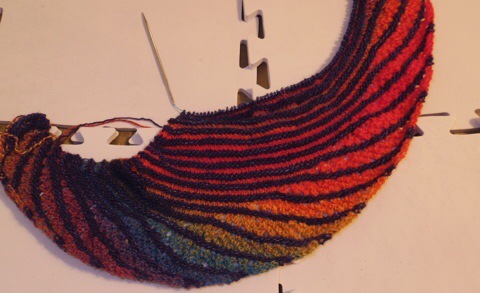 In general I really enjoy knitting stranded colorwork, cables, and some texture patterns (not all of them keep my interest). Lace is something that I do enjoy knitting on when I have the time needed to sit down and the mental capacity to follow a chart (or 10). Since summer is approaching as well I do not want some heavy sweater, blanket, scarf, or anything that sits on my lap and makes me even warmer. Lace is in general very light and if it does sit in my lap I generally am cooler then if I had a whole sweater in my lap. 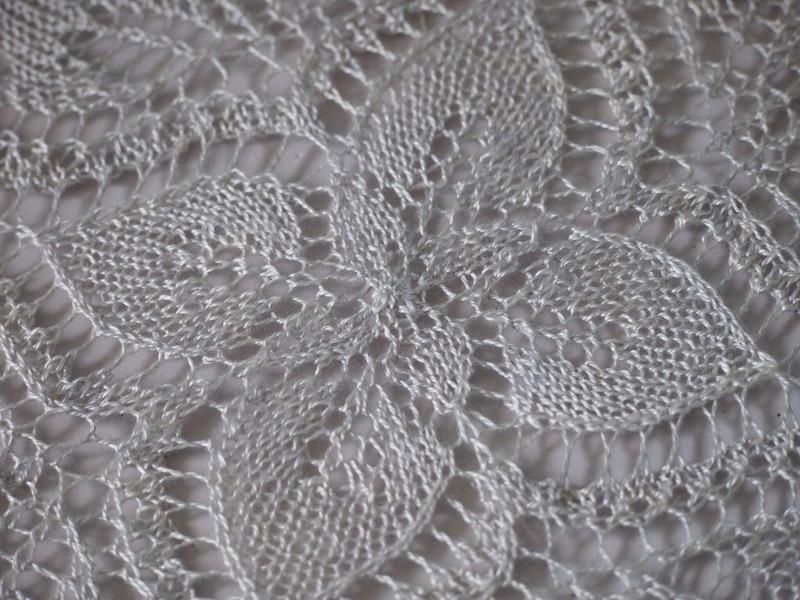 Add on to that I have a thing for pure silk lace yarn and you have a perfect storm. There is a bit of pure silk lace weight patiently waiting in stash for the right project to come along. I realize that this post is very late, there were really good intentions on getting more blog posts up when I was off for spring break last week. But things just happened and I think that I just needed some time to recover and get my brain back to a solid state. The amount of time i was spending doing school, work, homework, studying, etc was turning my brain to a warm brain like soup. No it was still contained in my head thankfully, but I just needed something to get it back to a more solid state and make me less of a brain dead zombie. You may be wondering about the title of this post, yes I am also making a weaving reference. I dug out the cheap rigid heddle loom out of the closet, got the two rigid heddle classes on Craftsy on sale and decided that I was going to learn to weave. The 5 project rule will apply for it, if I complete 5 projects and keep going then I’m allowed to upgrade the loom to maybe a table loom, or getting a wider loom (which this one is about 21″ and so that’s still pretty good). I have fallen for weaving, I’ve always had this fascination with the look and feel of woven fabric but I never knew would like weaving so much. The loom was warped for the first time with me and promptly produced a scarf in two colors of Shepard’s Wool. Right after another scarf warped on with Cascade Herritage sock and the weft is Amitola, in a rainbow color way which makes me very happy. There are plans to make some hand towels on it in the near future, use some handspun yarn on it too, the possibilities are endless. Once this scarf is done then only 3 projects to go and I’ll be able to upgrade my equipment. We will have to see if that will actually happen due to all the time constrains right now. For those who are wondering, yes finished woven projects will count towards a finished object and yardage, which I think is still very fair. The social pressure experiment is working very well, even with lots of temptation. I would go into my LYS for knit day/night and I would look around and see wonderful yarns, yarns I would love to work with. For example SweetGeorgia DK in this lovely Emerald Green that would be perfect for a cardigan, but I would have to give up 4200 yards, nope. Madelinetosh Dandelion in Tart, would have to give up 2500 yards, I have plenty of Tosh in stash. Or oh look at all of this summer yarn that would be perfect for summer knits and you should get some so you can make something for the warm weather that will be here sooner then you realize. Well I have some in stash I haven’t used so I’ll wait. 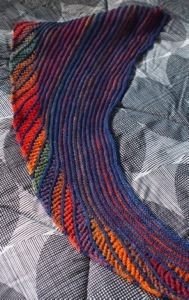 I did finish the second SharkTooth out of Madelinetosh Tosh Sock in Forestry. I had a error while working on this with my limited brain functionality (I think that when I was reading the directions my brain just said keep working as such, autopilot is now enabled) but it doesn’t look bad at all. I’m still quite pleased with it, but this one is also for my mom. I think that I will have to make just one more for me, but out of the color the pattern calls for, since there are 2 skeins of it in my stash. Finally the Little Wave Cardigan is done being knit, it’s blocked, ends for the most part are woven in, and all that needs doing is sewing the second pocket, and adding the buttons. First I have to find some buttons for it, there wasn’t anything at the LYS that really made me want to buy and sew them on right away. Well to be fair I’m not that much of a fan of sewing to begin with and the idea of sewing in buttons sounds just as fun as watching paint dry, but I love cardigans. Dilemma? Why yes I do have one, I know I’ll get buttons and put them in, just in time for summer… Once it turns fall again you know it will come out and be worn for all of the 5 seconds that I can actually wear long sleeves. For those of you who don’t, I run at a warmer body temperature so I can’t really wear long sleeves or pants that often. Most of the time it’s short sleeves and shorts and that is very comfortable for me. It’s insane that I knit these sweaters and other wool things for myself, but someday I’ll be somewhere colder where I can actually appreciate my handy work. For now they’re just admired and kept waiting for that time when they’re needed. The newest thing that is on the needles is a nymphalidea. I wasn’t sure if I was going to start one in the near future but once I saw two of my knitting friends work on and finish theirs I was hooked. According to the social pressure experiment I had to stash dive. I knew I wanted to use the Crazy Zauberball in the color 1702 kleiner fuchs. It is such a fun color, bright, and makes me happy every time it see it and work with it. For he contrast I tried one yarn and I wasn’t happy. I ripped it out and pulled out a different skein, Madelinetosh Merino Light in what we believe to be Stovepipe. This made it way better, I’m so happy with it so far. Every time I get a few minutes to work on it, it makes me so happy. And with this rainy weather you know that I should be wearing that little wave cardigan, except it needs those buttons and slight sewing. Oh well, it’ll be ready for the next time. Buttons….